The latest creation from Zapata is being likened to an aerial "Segway" ... a stand-on platform with handgrips steered by shifting body weight. The difference is ... it flies. 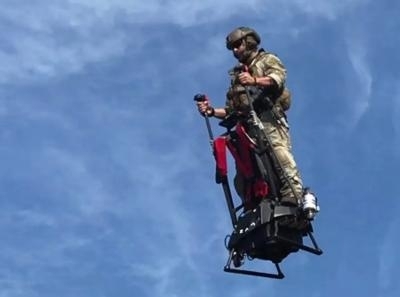 The website New Atlas reports that while the concept is similar to the Fyboard Air, which is more like the device flown by The Green Goblin of Spiderman fame, the Ezfly is, as its name would suggest, easy to fly, requiring little training. You simply stand on the platform, grip the control sticks, and hit "go". The operator is not attached to the device in any way. In a video shot last October in Texas, no fewer than 10 people operated the Ezfly with little or no training, zooming over the surface of a lake. There were no incidents in which a person fell of the device. At least two of the testers are shown wearing military gear. Such personal transportation devices are of great interest to the U.S. DoD. The testing has sometimes been conducted with the blessing of authorities, and sometimes not, according to the report. There also does not seem to be any safety system built into the Ezfly. The company is still being pretty tight-lipped about the Ezfly, with only basic information about the device posted on its website.